Still getting use to the new looking screen as everything still looks a bit strange to me.Can’t believe the difference calibrating your screen can make.This image looks how I felt after my weekend away climbing and sliding down hills and rocks,I felt about as old as this chair looks!Tried out some different scenes instead of the beach I was trying out the bush. ~ by Mel on September 23, 2008. I would like to see the foreground grass around the table lighter though and darken the grass in the background…. Dylan, when are you going to come over and give us some ps lessons? Was thinking about subscribing to Kelby Training but maybe you’re the man! Yes very nice shot! the house in the background is a little distracting though. Nice one Mel. Did you re-process this after you had the screen calibrated? The shot looks like it was taken at some sort of secret spot? Yeah i did but only had to drop the contrast down a little.I am use to the screen now.As for the spot I just might take you there….one day! 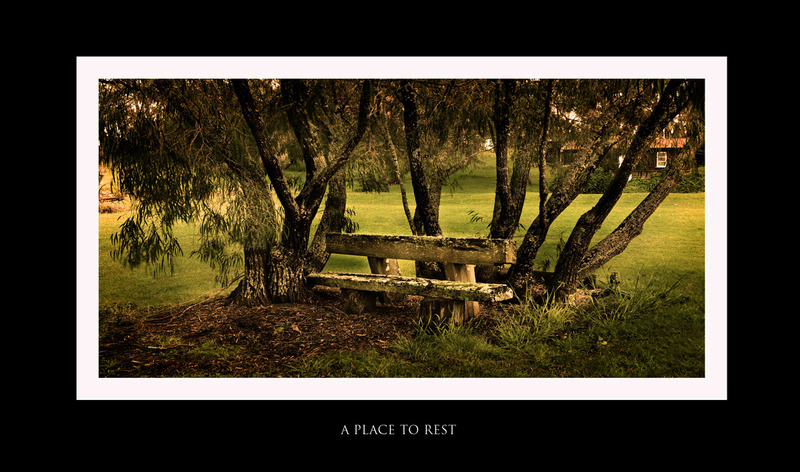 It certainly looks like a really restful place. I can see myself just sitting down, shutting my eyes and relaxing there. Well done.